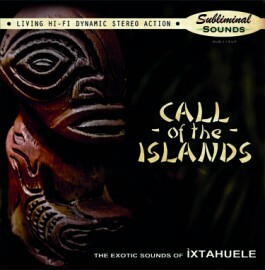 Lush & exciting, rich & vibrant, IXTAHUELE are back with their 2nd full-length album. Guiding your mind’s eye over oceans and mountains, through jungle and desert, teasing and enticing your ears with layered soundscapes and catchy melodies, you’ll find yourself whistling along on a winding mountain road, stalking through the rainforest, or humming lazily on a tropical beach. Building on their previous releases, both musically and thematically, the group flirts with jazz, mambo, and space age pop, all the while retaining their classic acoustic exotica sound and a high level of musicianship. This is music to lounge by the pool to, this is music for armchair traveling on a cold rainy night, and it’s the perfect soundtrack for a quiet drink with a lover or a friend. Sophisticated and savage, it’s exotica for the modern age!